TGI Fridays sign in Arabic. Tonight a bunch of people went to the horse races at Meydan. Jimmy and Mike Walsh decided horse races weren't their spectator sport of choice and I had already seen the races with the hospitality group so the three of us went to the Dubai Mall instead. We headed to TGI Fridays for dinner. The restaurant is located on a balcony overlooking the fountains. After about a 15 minute wait, we were seated at this table right next to the railing outside with an awesome view of the fountain shows. The food was great. The fountains did a different show every half hour. My favorite was watching the fountains dance along to the beat of Michael Jackson's 'Thriller'. Quality stuff. Excellent view of the fountains during dinner. 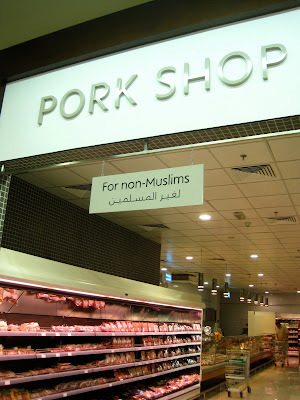 Pork Shop: For Non Muslims. So here's the deal, Muslim's don't eat pork, ever. Because of this, none of us have had any pork in our entire time here. Then suddenly in front of us was a huge room full of just pork items; ribs, pork, BACON. It was just awesome to see. And the sign was kind of funny. Headed to Fibbers for the live music. The guy singing was great, and his outfit was even better. 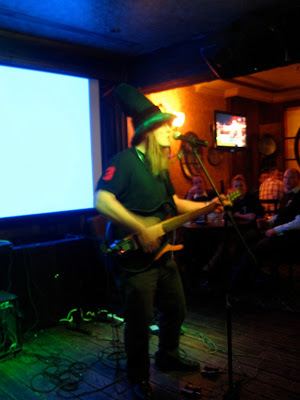 Live music at Fibber Magees. Jimmy and me at Fibbers. There was this big obnoxious group of guys that came into Fibbers at one point. They were all dressed in ridiculous golfing outfits. Golf gloves, upside-down and backwards visors, bright colored pants, golf shoes, and polos. We talked to a few of them and found out they were "Pub Golfing" to celebrate two of their friends' birthdays. From what I could gather, every bar has a "par" and they going around to 9 different bars in one night. They looked ridiculous but were really funny to talk to. Some of the crazy Pub Golfers dancing around at Fibbers.